ROYAAL Z - Bred by Leon Melchior at the renowned Zangersheide Stud in Belgium, this special Hanoverian stallion possesses a phenomenal pedigree of superstar jumpers. 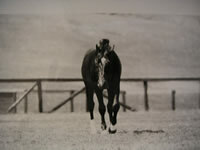 He is a direct son of the prepotent RAMIRO Z -- one of the top 10 international jumping sires of all time, often labeled Stallion of the Century, and producer of such famous horses as the wondrous double Olympic gold winner RATINA Z. Royaal Z's grandsire was the influential Polish-bred stallion RAMZES, a top horse who produced Olympic horses for both dressage and showjumping and whose influence in breeding continues to this day. 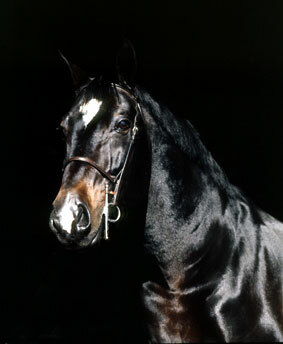 Just as notable is Royaal Z's maternal grand-sire, the extraordinary stallion FERDINAND -- who in his own time (1944-67) was perhaps the most famous producer of show horses in the world, consistently passing on very correct conformation, courage, and confidence against all other bloodlines. True to his lineage, Royaal Z has an extraordinarily kind temperament and has demonstrated unlimited scope and talent in the jumper ring. This, in addition to his stunning beauty and correct conformation, makes him a highly desirable component in any breeding program. 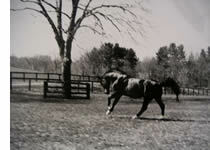 Subsequent to a career in Europe as an Open Jumper, Royaal Z was purchased and imported to the U.S. by an amateur. His fabulous personality made him equally appropriate in the amateur, adult amateur and equitation divisions, with many winnings in South America and the U.S. Attesting to his willingness and athletic versatility, he was invited to replace a horse at the last minute at the 1999 Winter Equestrian Festival Vaulting Exhibition in Wellington, FL. Royaal Z delighted spectators by performing as if he'd had gymnasts upon his back for years, when in fact it was his first experience as a vaulting horse. As an AWR licensed first premium breeding stallion, all of Royaal Z's American foals are eligible for nomination by AWR to register for Zangersheide's WBFSH World Championship Young Jumper competitions..
A note on fertility: Royaal Z's high fertility is remarkable. Karen Berk, of Equine Reproduction Services, reports Royaal Z to have the second highest concentration of any stallion in her company's history. What is more impressive is that the first-place horse, at 981, was 13 years Royaal's junior, and they were only 10 points apart -- with Royaal at 971. Karen frequently uses Royaal Z as an example of a true breeding stallion. Stud fee $1800. EVA negative. Frozen or cooled available.